By JEANNE BAMBERGER, Massachusetts Institute of Technology. Written for use as an introductory music fundamentals text or elements-based appreciation text, Developing Musical Intuitions is designed to help students become active and engaged music makers - listeners, performers, and creators - by teaching them how to value, understand, reflect upon, and build upon their own powerful musical intuitions and their existing understanding of musical culture. The book is packaged with the groundbreaking software application impromptu, which enables students to carry out projects in which they discover and build their own understanding of the universe of music. Conventional approaches to basic musicianship have generally ignored the well-developed musical intuitions students bring to beginning music study. Concentrating on the smallest levels of musical detail - individual pitches, metric values, intervals, and basic notation - these approaches actually impede progress by asking students to understand what they cannot readily hear. 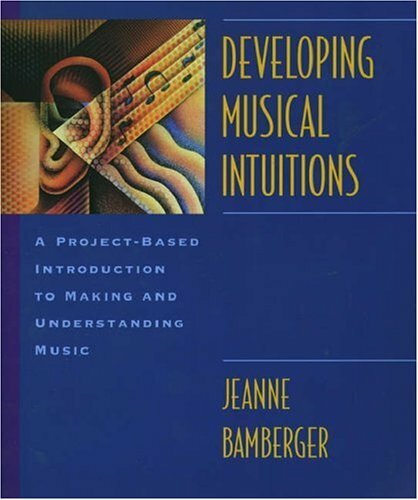 In contrast, this text begins with students' intuitive units of perception: musically meaningful entites such as motives, figures, phrases, and melodies, and structural functions such as stability versus instability. Beginning with these musical "simples," Developing Musical Intuitions first explores what students hear, then leads them to consider increasing levels of detail. Working with chunks of musical information, students learn to create a structural framework for their musical intuitions around which descriptive details -- pitch, rhythm, harmony, and form -- can be added. The centerpiece of this package is the interactive software program Impromptu, developed for Macintosh computers and optional MIDI synthesizer. Impromptu provides students with meaningful musical units -- "tuneblocks" -- represented by patterned icons. As students listen to, rearrange these tuneblocks, they use them as functional elements with which to design simple musical compositions. In the process, they discover for themselves how music works. In addition to the text and accompanying software, the book features numerous illustrations and an audio CD of brief listening examples. The complete package includes book, audio CD, Impromptu software installer on two floppy disks, and Impromptu user's guide. Available separately: software alone, for purchase by schools; text and audio package without software, for students who will use a copy of the software purchased by the school. Available free for examination: demo version of Impromptu software. Available free upon adoption: Instructor's Manual. Free download of the accompanying software, Impromptu, can be found at tuneblocks.com. Jeanne Bamberger and Armando Hernandez © 1999.